Bradley M Lott, Major General, U.S. Marine Corps (Ret) is a professional motivational and keynote speaker offering programs on government sales, marketing, innovation, and procurement strategies. Having won acclaim from both Government and commercial audiences for his straight forward and insightful speaking style, General Lott can provide a first person account that will educate and influence attendees of any event, big or small. In recent years he has spoken to over 50 Michigan communities about how to go after and obtain government contracts by implementing a tactical plan to change requirements and promote new technologies. Through his motivational speaking he has convinced hundreds of companies to diversify into the Defense and Homeland Security industries saving thousands of Michigan jobs and Michigan companies. General Lott brings an inside perspective regarding military needs and requirements, and extensive experience in logistics, acquisition and contracting. 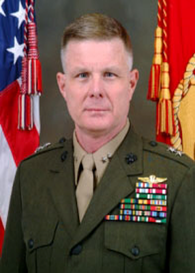 He commanded the Marine Corps Logistics Command, which is responsible for providing worldwide supply chain management and support to the Marine Corps’ Operating Forces. General Lott’s warm and candid style and exceptional delivery will both entertain and enlighten your audiences.